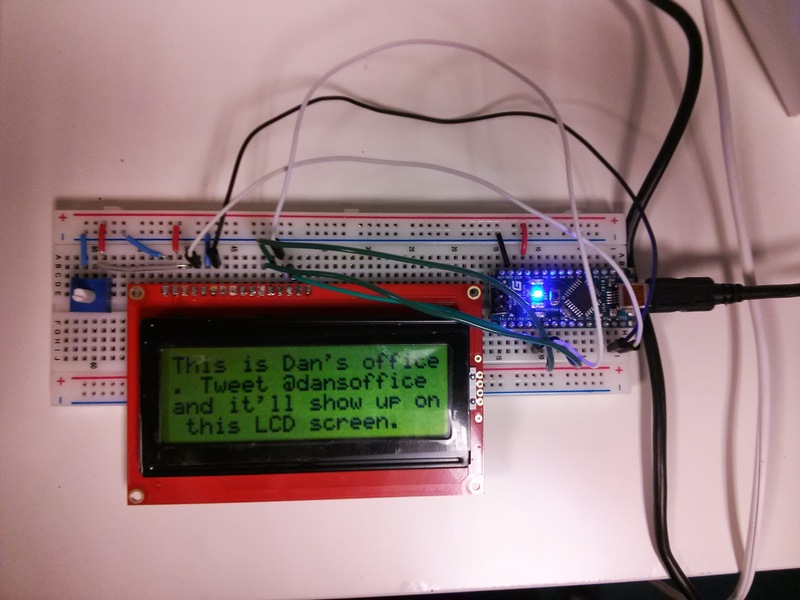 I've got a little LCD screen. I thought it'd be neat if anyone could tweet and it'd show up on that screen. Kind of like that goofy thing at basketball games where you can send a text message somewhere and maybe it'll show up on the huge scoreboard. Code's on github, if you're into that sort of thing. I created a new account called @dansoffice, and I want to get every tweet that mentions @dansoffice into my twitter program. I want it real-time, and I don't want to get rate limited for polling a lot, so I looked to their streaming APIs. And Requests even handles streaming requests via iter_lines... sort of. It's got a "chunk size" - a buffer that must fill up before it does anything. For some reason, this sometimes stops tweets from being read, until the next tweet comes in and clears out the buffer. Known issue. So in my case, a terrible hack: also request that tweets are delimited by length, so the length comes in, followed by a newline, and clears the buffer; at this point, send another request (this one non-streaming, to mentions_timeline) to get the actual text of the most recent @dansoffice mention. Ugh. Python writes nicely to serial, via pyserial. Found my serial port's name from Arduino (tools->serial port menu). Easy enough to write to it when I get a tweet. Now, as long as my little twitter monitor is running, and the Arduino is connected, tweets mentioning @dansoffice show up in real time. Now all I have to do is get a long mini-USB cable to stretch to my window. All the tweet-publicizing excitement of the NBA! Could this project be updated with using a LED matrix, and arduino Yun for wifi? Probably. I'm not familiar with Arduino Yun, but that would be super cool - avoid the need to be plugged in. Thanks for the tip!